If you have Medicare or private insurance, and believe your lift chair recliner should be covered, please contact our liftchair experts at 800-791-6814. Our staff will be happy to provide expert guidance to obtain the best solution under your insurance coverage. If you have Medicare coverage and qualify, Medicare will reimburse you for the cost of the lift mechanism inside the lift recliner. This is approximately $300 depending on which Medicare region you are in. Approximately 80% of our customers file for reimbursement. The patient must have severe arthritis of the hip or knee or have a severe neuromuscular disease. The seat lift mechanism must be a part of the physician's course of treatment and be prescribed to effect improvement, or arrest or retard deterioration in the patient's condition. Once standing, the patient must have the ability to ambulate (walk). Coverage of seat lift mechanisms is limited to those types which operate smoothly, can be controlled by the patient, and effectively assist a patient in standing up and sitting down without other assistance. Excluded from coverage is the type of lift which operates by spring release mechanism with a sudden, catapult-like motion and jolts the patient from a seated to a standing position. 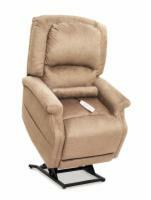 Coverage is limited to the seat lift mechanism, even if it is incorporated into a lift chair recliner. We will provide you with the bill of sale for the liftchair. You may obtain the CMN right here. Take or mail the CMN to your specialist for their completion. Once completed by your doctor, mail the CMN, bill of sale, and the doctor's prescription to your Medicare regional claims office. If approved, you will receive a check back for reimbursement.